With the UK’s most prestigious film and television awards taking place later today (18 February), it’s time to enter into a round of foolproof – or is that foolhardy? – predictions on who will win at the 71st British Academy Film Awards. To add an extra level of frisson, the Baftas are historically seen as an indicator of Oscar winners, so the outcome on Sunday night will surely be seen as a predictor for the Academy Awards in March. Now, on with our predictions. A strong line up, to be sure, all of which appear to have a shot at the title. But dig a little deeper and things aren’t as simple, as several of the entries have been dogged by some controversy. Three Billboards has been accused of racism in some quarters, whereas Darkest Hour’s simplified historical drama has proved a damp for many. Its WWII counterpart, Dunkirk, may also be seen as a Brexit metaphor too far. The Shape of Water too, is currently being accused of plagiarism, and gay drama Call Me By Your Name has been predictably shunned by the Fox News crowd, so it’s hardly plain sailing for any of this year’s entries. Nevertheless, The Shape of Water is not just a safe bet – it has proved consistently popular with audiences and critics, with many calling it among director Guillermo del Toro’s best work. Another cracking and diverse set of entries here. After Darkest Hour misses out on the Best Film gong, it might get a crack at the whip here, but beyond its central performance there really isn’t much of substance here. Similarly, Chris Morris’ satire The Death of Stalin may suffer as a comedy, whereas Lady Macbeth, though superb, came out too early in the year to make enough of a splash at awards season. Really, though, is there any question what this one will go to? Marmalade jars at the ready. An award that sets out the British Academy as a champion of home-grown new talent, previous winners include Bart Layton (director) and Dmitri Doganis (producer) – The Imposter Babak Anvari, Emily Leo, Oliver Roskill and Lucan Toh for last year’s Iran-set terrific Under the Shadow, and Stephen Beresford and David Livingstone for the beloved Pride. As fun as Jawbone is, it’s perhaps not up to taking on heavy-hitters like The Ghoul or haunting doc Kingdom of Us. William Oldroyd’s Lady Macbeth is a strong runner in this race, but its Zambian setting and timely subject matter on the exploitation of young women make Rungano Nyoni’s effort the real standout in this category. While the line up here is very strong, there are three leading contenders: Icarus, An Inconvenient Sequel and Jane, all of which could easily take the gong. However, Al Gore’s follow-up to his Inconvenient Truth could hardly be said to have made the same impact as the original, essentially foretelling more of the same environmental disaster, but worse. And it’s questionable whether Icarus connected with audiences sufficiently to put it ahead of the pack. In contrast, Brett Morgen’s study of Jane Goodall ticks a lot of the right boxes – a beloved national treasure as its subject, gorgeous photography, all wrapped up in an environmental message that is neither controversial nor doom-laden. There may be only three nominations in this category (seriously, where is the Lego Batman Movie? ), but at least that means we don’t have to endure the ludicrous prospect of Boss Baby being nominated for a Golden Globe, an Oscar and a Bafta. My Life as A Courgette was a beautiful, mature story but seen by too few. Similarly, the seven-year production cycle of Loving Vincent, in which every frame literally is a painting, is a stunning technical but perhaps didn’t quite connect with audiences. But with Pixar knocking it out of the park (again) with Coco, is there any doubt as to who will ultimately walk away with the award? The front-runners for Best Director are undoubtedly Denis Villeneuve, Christopher Nolan, and Guillermo del Toro. However, with the Blade Runner sequel more likely to clean up in the technical categories and not nominated for Best Picture, it’s improbable that Villeneuve will walk away with the coveted Bafta mask. Seven out of the previous ten Best Director wins went to the Best Film winner, so if that pattern is to be believed, and The Shape of Water does indeed take Best Picture as predicted, that leaves one clear winner. Without nominations in any other categories, we might expect the judges to reward Jordan Peele for his searing Get Out screenplay here, and they may well do that. However, there are no women nominated for Best Director, and all of the Best Picture nominations were directed by men. Accordingly, the Academy will be unlikely not to take this opportunity to reward a female writer, so there is only one clear choice here. Simon Farnaby and Paul King’s warm screenplay for the second Paddington outing potentially puts this ahead, though after it wins Best British film the Academy may want to reward another team. Ianucci’s satirical The Death of Stalin and Greenhalgh’s moving work for Film Stars Don’t Die in Liverpool are the most obvious choice, but with so much buzz around it, and losing out in the other categories, our money’s on James Ivory’s screenplay. Five nominees in this category and all, frankly deserve to win. Saoirse Ronan could easily walk away with Best Actress to accompany Greta Gerwig’s Best Screenplay. Equally, Sally Hawkins’ achingly romantic turn in The Shape of Water and Annette Bening’s heartbreaking performance as waned star Gloria Grahame are both worthy of the award. 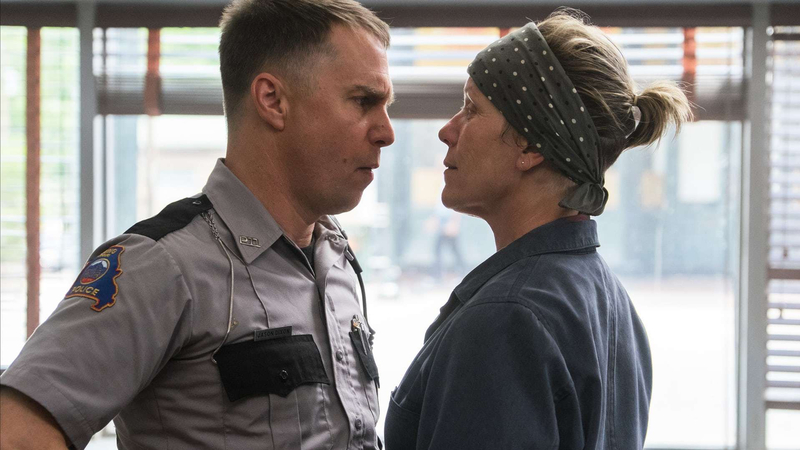 But there’s little doubt who will take it on the night, with McDormand’s blistering role as grieving mother Mildred arguably her best ever. While it would be wonderful to see Jamie Bell pick up a gong for his career-best turn, or indeed rising stars Daniel Kaluuya and Timothée Chalamet take the award, there are only really two horses in this race: Daniel Day-Lewis and Gary Oldman. Day-Lewis gives arguably the more accomplished performance, as his (allegedly) final role, he may yet take the award. But the buzz has almost exclusively been around Oldman’s choleric turn as Winston Churchill. Oldman’s histrionics and the prosthetics that transform into the jowly war Prime Minister are pure awards bait. This race is much closer than the leading actress category, with performances across the board. Nevertheless, out of the five nominees, Allison Janney, Laurie Metcalf and Lesley Manville are the most likely to take it. Metcalf’s beleaguered mother in Lady Bird has received universal acclaim, but there’s been buzz around Janney and Manville too. Between these three, this one is anyone’s guess. There are only two horses in this race. Christopher Plummer, for all his exceptional last-minute work, will find his nomination unfortunately tainted with the controversy of his predecessor. Woody Harrelson gave was excellent, but overshadowed by his co-star Sam Rockwell, and Hugh Grant, is well, Hugh Grant. It could easily go to Rockwell, but with little recognition elsewhere, the smart money is on Willem Dafoe for The Florida Project. The 71st British Academy Film Awards will take place at the Royal Albert Hall on Sunday 18 February.